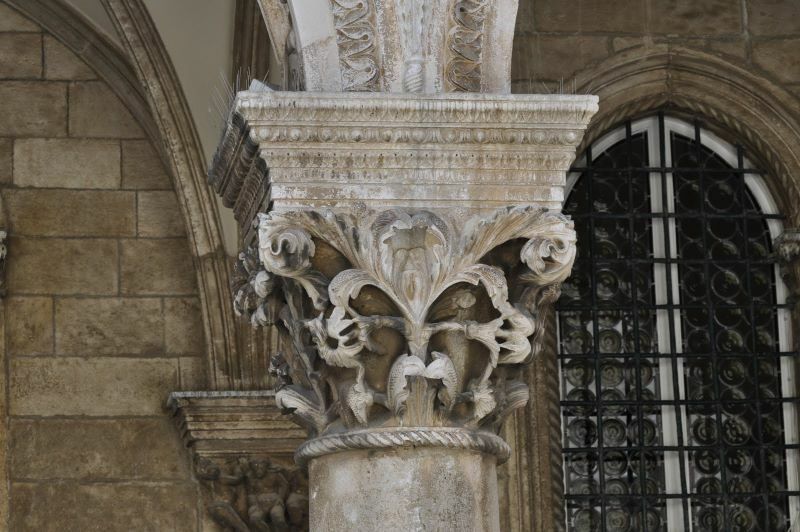 Note: This presentation provides further pictures and commentary for our Dubrovnik overview. It's best to see that presentation first by clicking here. 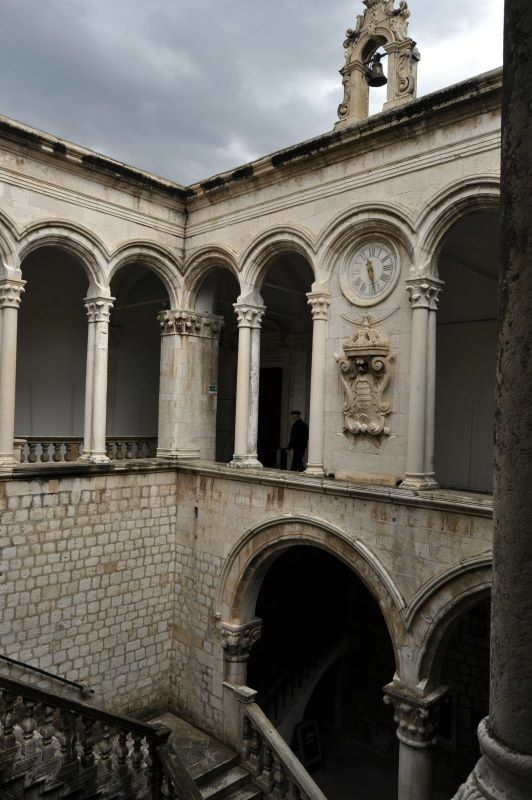 This somewhat warped picture shows perhaps the most significant secular buildings on the Dalmatian coast -- the Rector's Palace. Architecture here is the inverse of history: the lower floor has a Renaissance loggia supporting beautiful Gothic windows above. 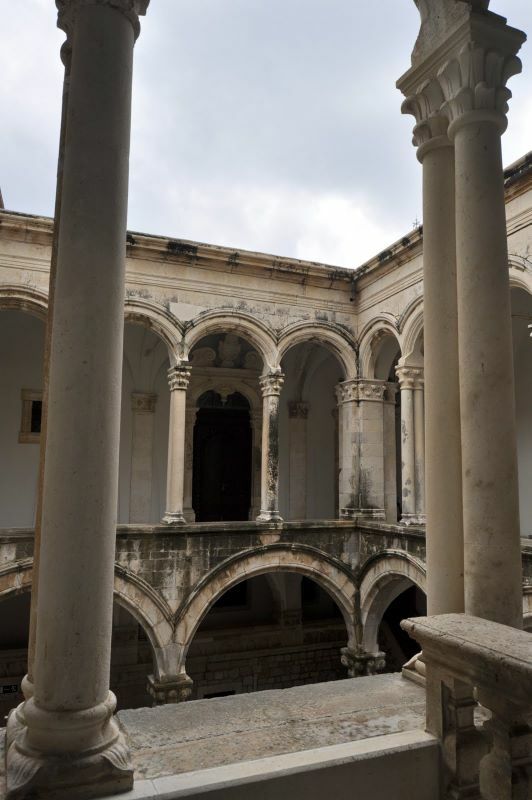 The wide areas on each side of the loggia were once the base for towers -- both of which were damaged when the place suffered a fire and explosion 11 years after it was built -- to replace an earlier fortress destroyed by an ammunition explosion. 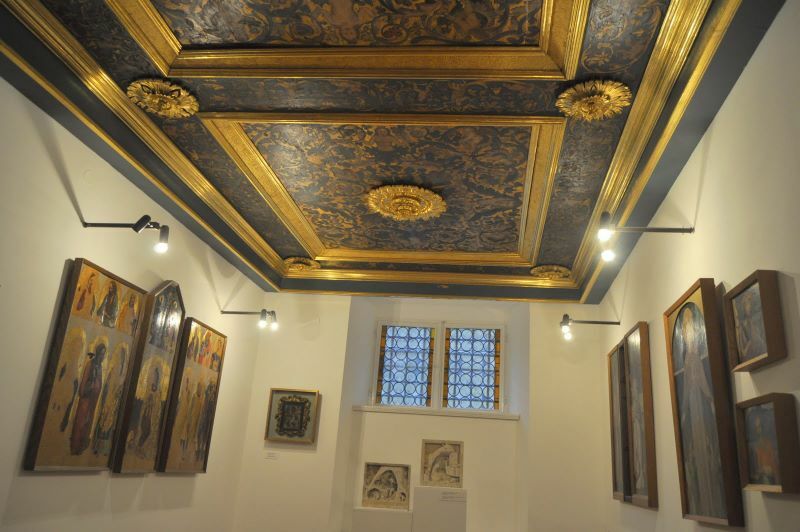 Two major earthquakes also took their toll and the rebuilding of this once-Gothic building cleverly harmonizes Renaissance and Baroque elements as well. 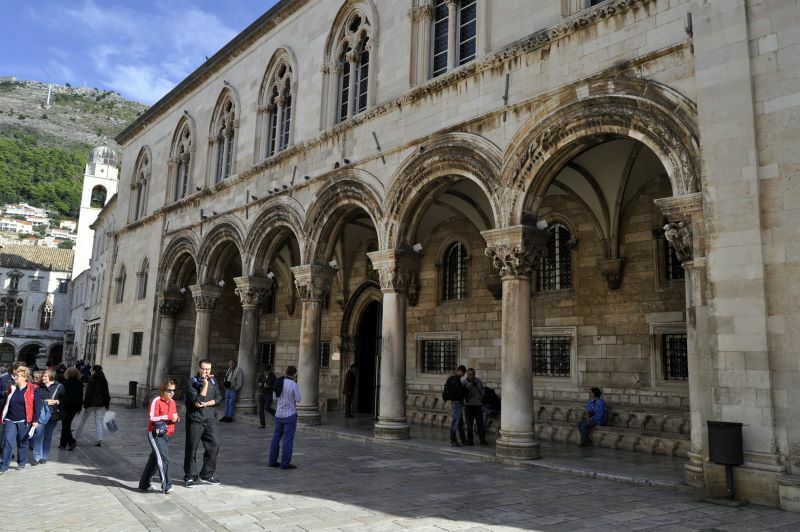 This should be called the Rector's Prison as whichever noble was serving the 30-day term could not leave the building except for official business. 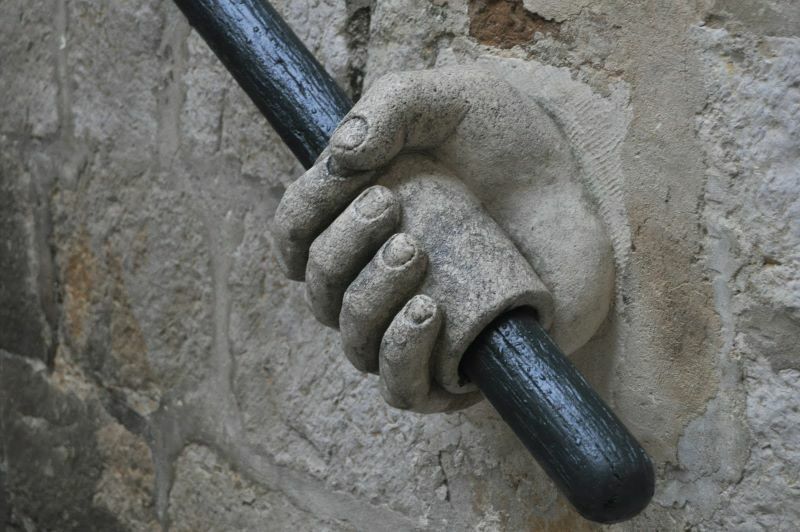 Each night the keys to the locked gates were brought here and turned over to him in a pompous ceremony. 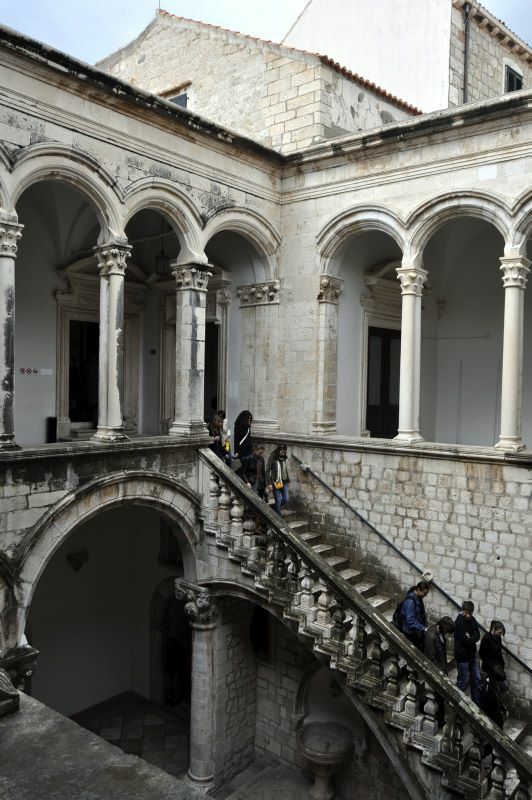 Despite earthquakes, fire, gunpowder explosions, and a variety of remodeling by several prominent architects, the Rector's palace maintains a harmonious exterior -- and a truly remarkable Renaissance atrium with baroque upgrades. 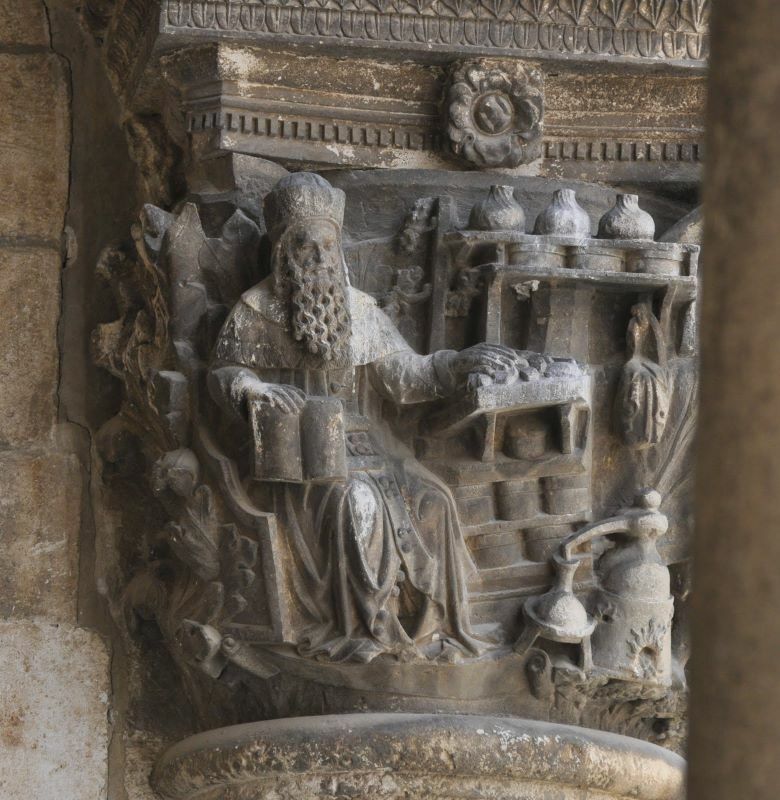 The Rector and the Senate would sit on those stone seats to meet with supplicants. 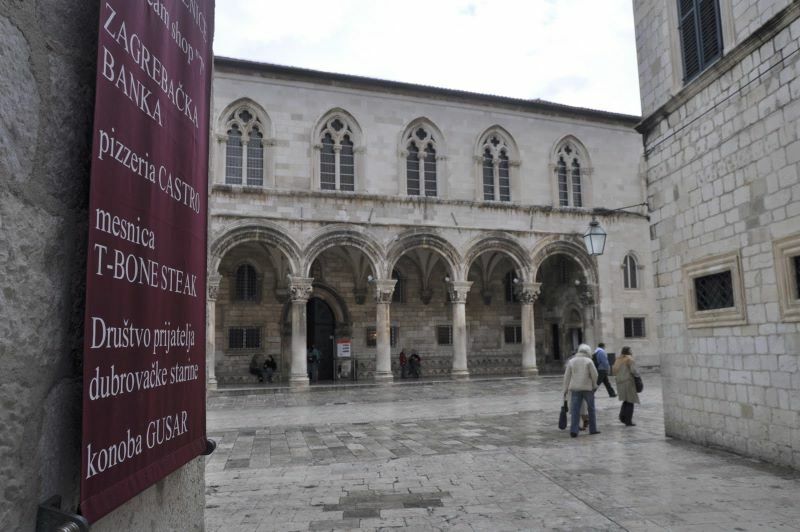 With the Cathedral (right), the Rector's Palace anchors the south end of a stubby street that leads at its north end... ...to the Sponza Palace (its arched loggia shows at the end of the street where it meets the main drag called the Stradun). 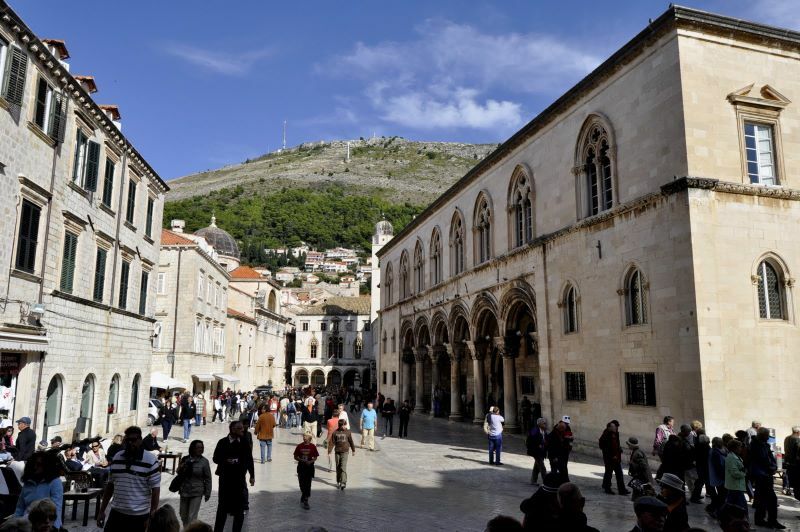 Looking up, we see Mount Srd, Dubrovnik's protector from the harsh north winds (called the bura). Mount Srd (we don't need no stinkin' vowels) shows traces of the fort the French built when Napoleon's guys were invited in and wouldn't leave. In 1991, the Serbs shelled from up there and destroyed the cable car that used to take tourists to its summit, over 1300 feet high. 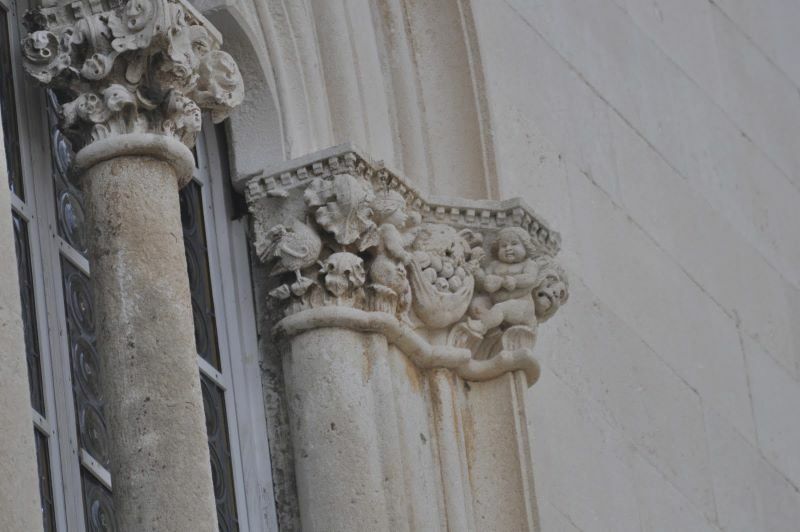 Events have conspired to destroy this building as well; rebuilding has changed its exterior dramatically. 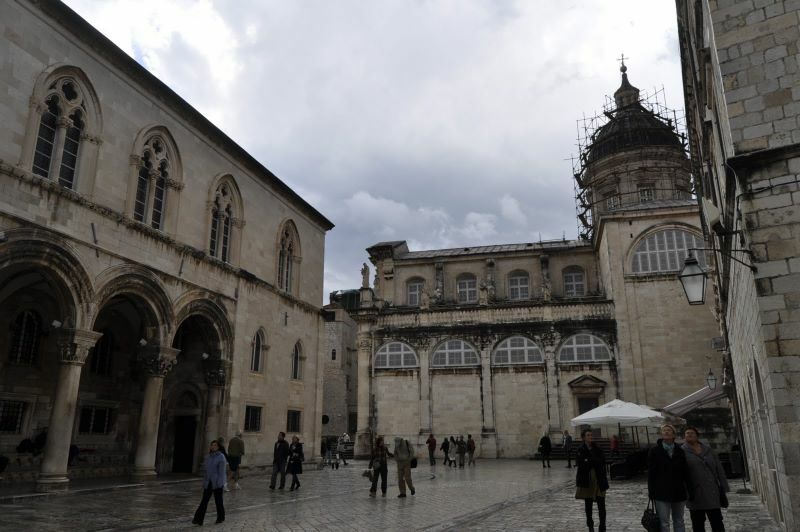 The front (west) originally had towers that disappeared in a 1463 explosion. 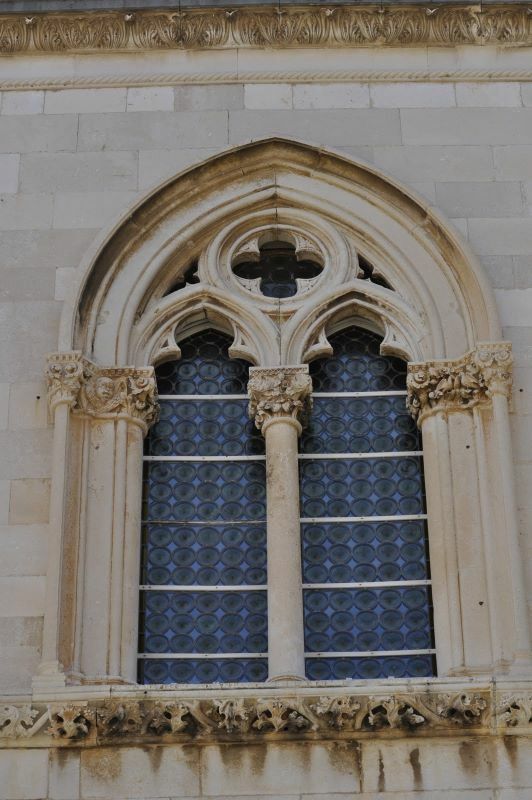 The facade then received its upper Gothic windows over a Renaissance loggia. 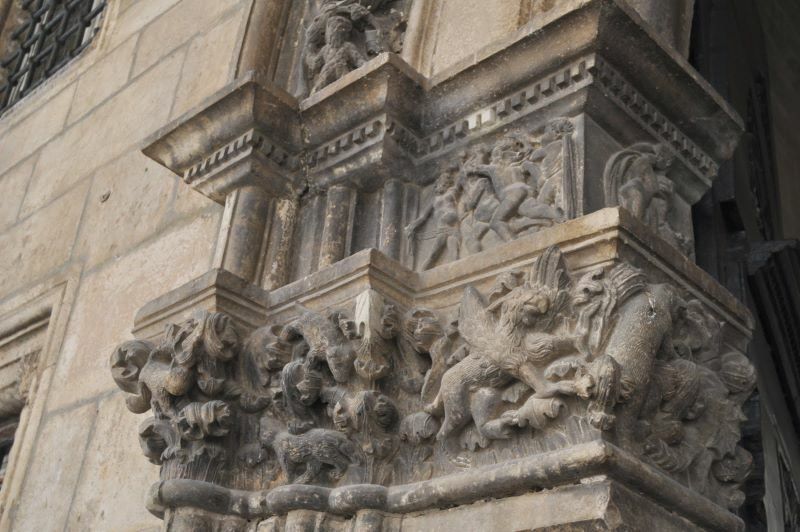 The south end (we see a bit of it at the right) was restored after the 1520 earthquake in the Baroque style. 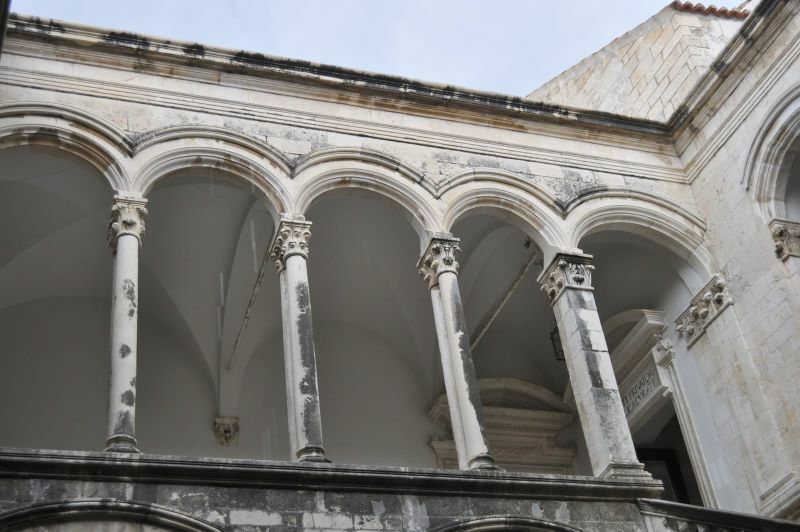 Severely damaged, somehow this structure survived the 1667 earthquake that leveled nearly every other building within Dubrovnik's walls. 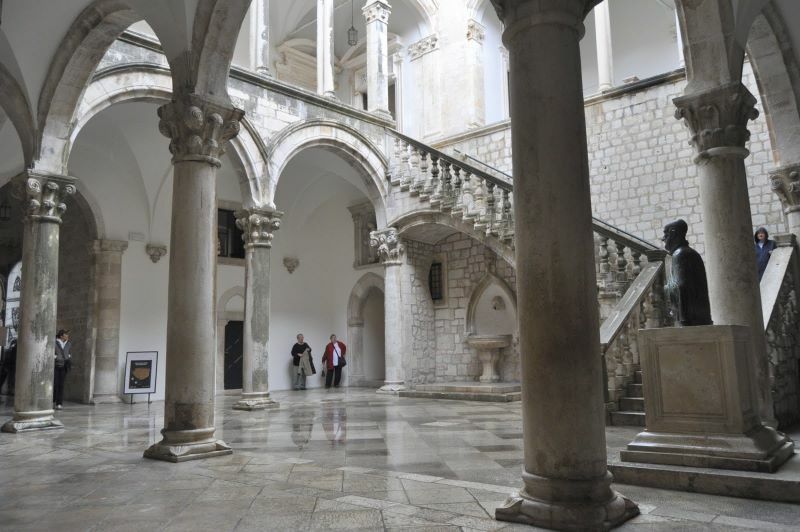 ...the atrium of the Rector's Palace -- a Renaissance jewel with a baroque staircase added after the 1520 earthquake. 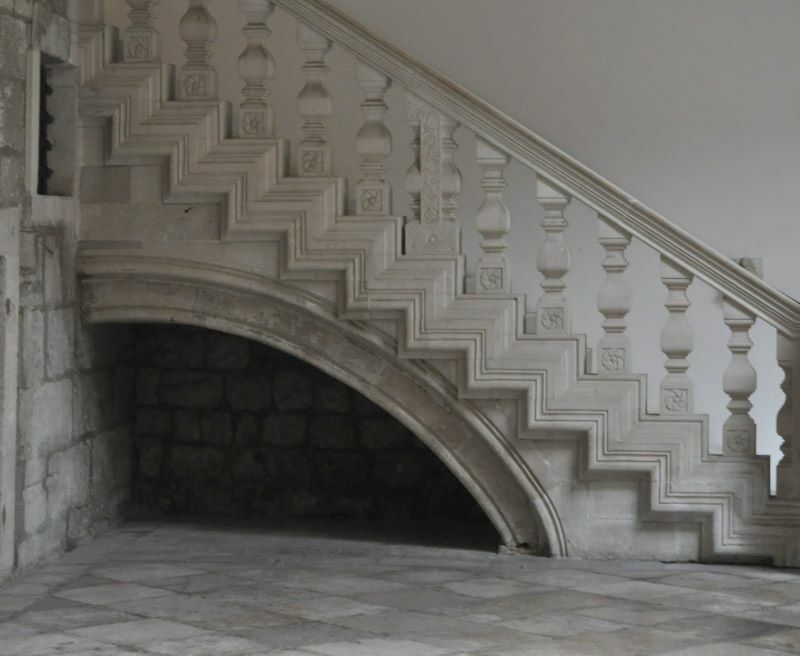 Supposedly these stairs were used only once a month when the new Rector replaced the old. 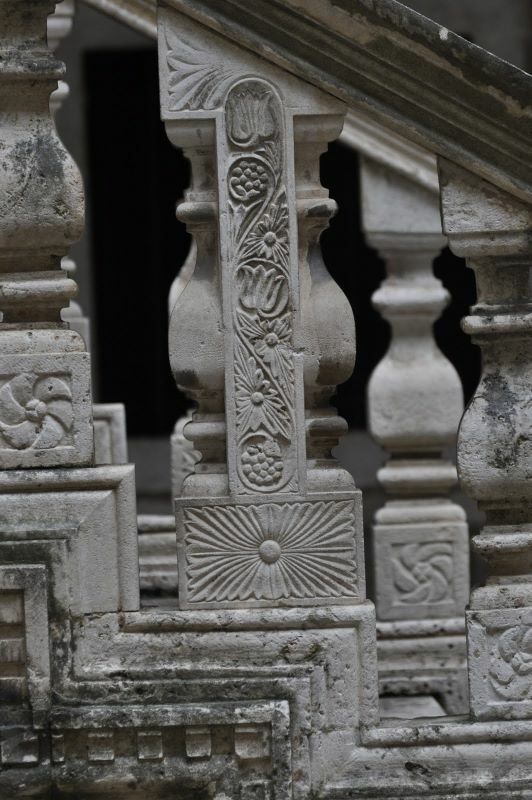 The ornamentation on the staircase contrasts with the simplicity of the stones in the small ashlar wall. Rain kept chasing us under the arches. 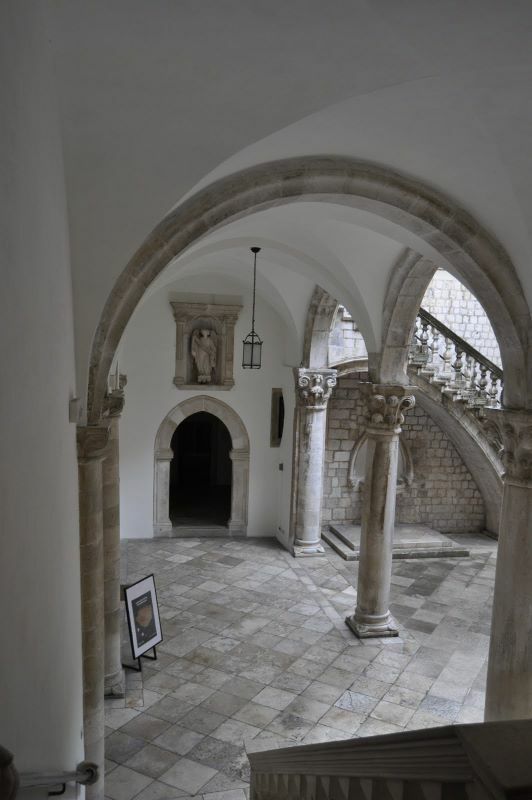 Many of the rooms on the ground floor were used to dispense justice: as courts or prison cells. 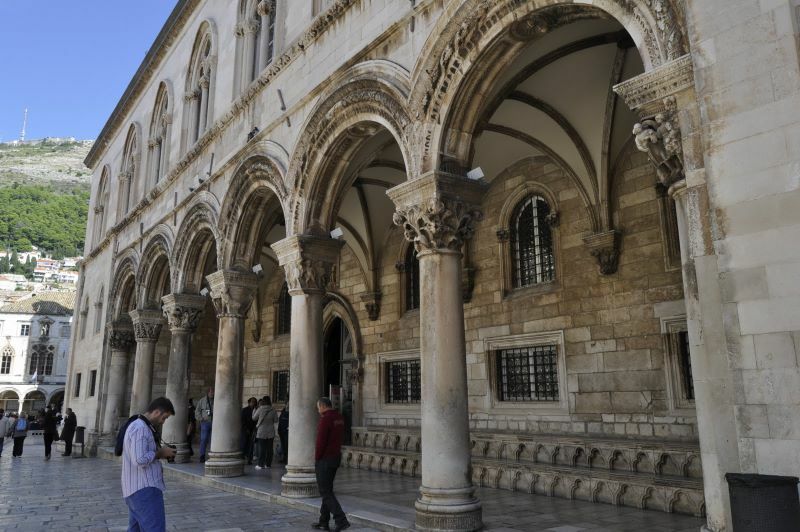 Dubrovnik strongly supported the rights of the individual -- but deemphasized the accomplishments of individual persons, fearing that adulation might lead to tyranny. Most positions of power like that of its Rector or commanders of its forts were restricted to one month terms to keep anyone from becoming too strong. 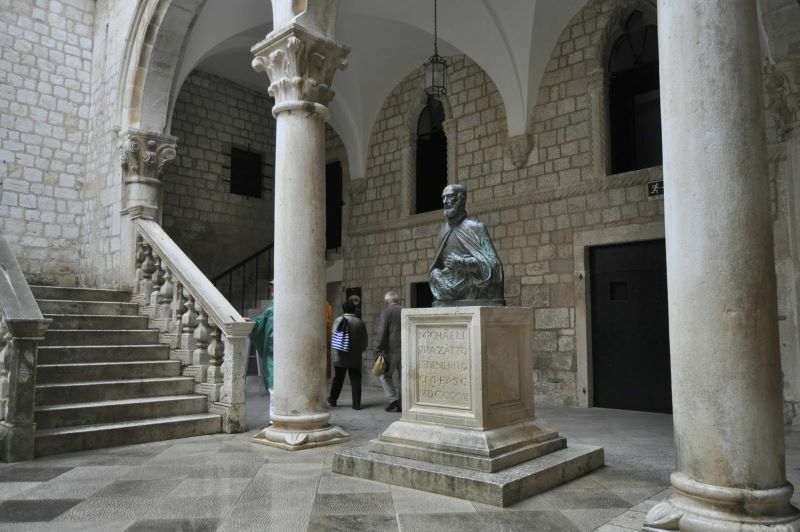 In its 400 years of independence, Dubrovnik never erected a statue to a historic figure -- except here with this bronze of Miho Pracat. 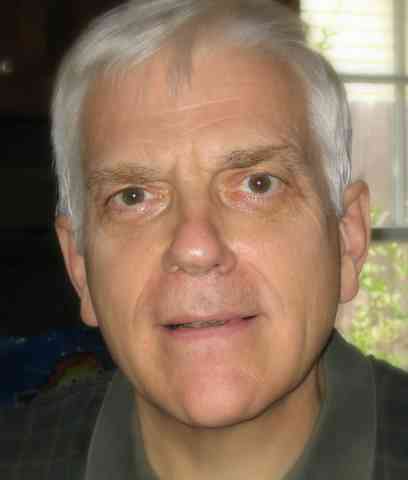 Pracat was a commoner (the lowest grade in the social hierarchy and forbidden from holding public office.) Yet he became rich through shipping, supported the Franciscans, and left huge amounts for charity. 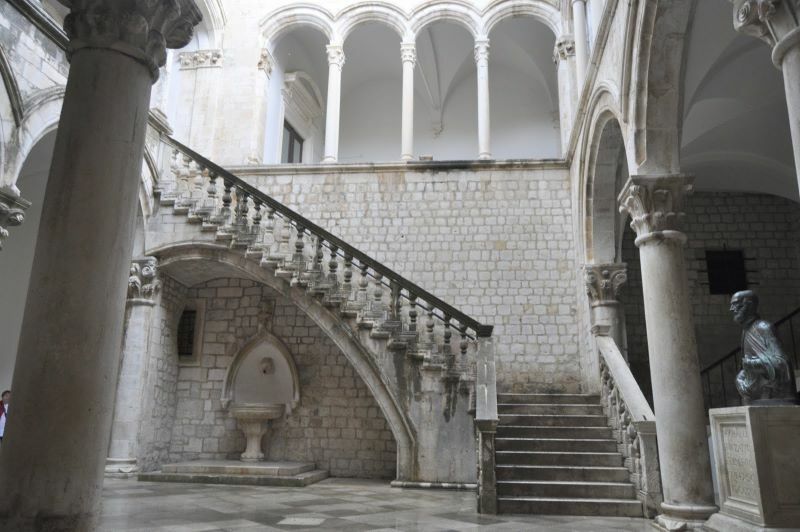 With the grand staircase used only for the monthly changing of the Rectors, daily movements must have been up and down this smaller of the atrium staircases. Both staircases are spectacular in their own way... ...including their hand rails. 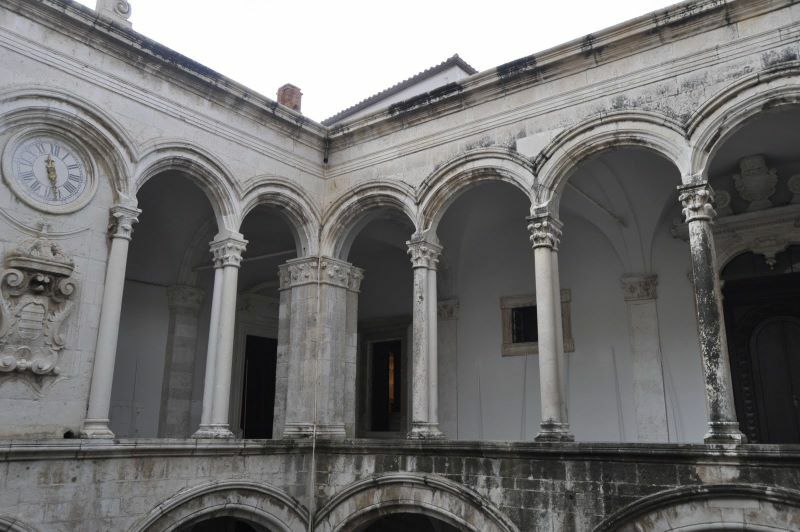 The 5 renaissance arches at the top of the atrium suggest the 5 similar arches in the entrance loggia on the western facade. 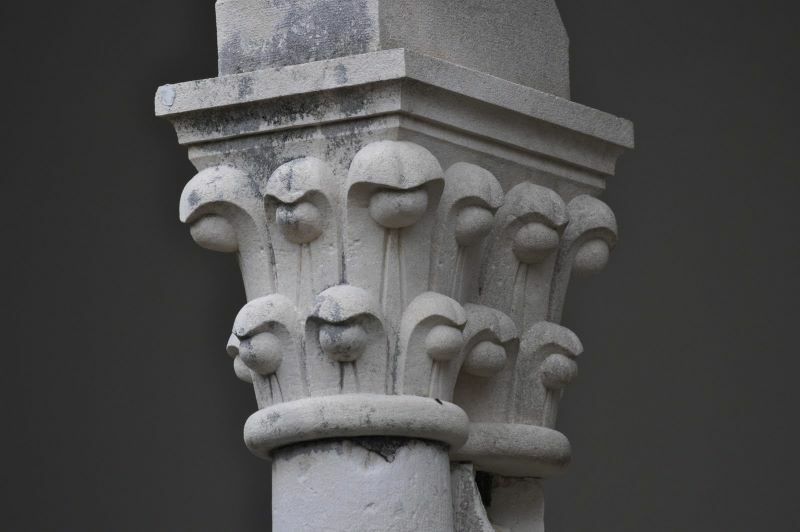 These are double columned with Corinthian-like capitals. 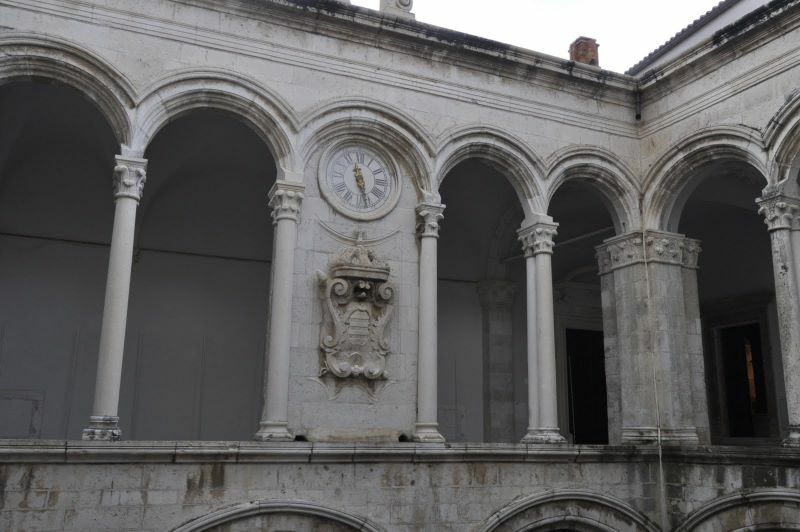 A small bell tower rises above this clock at the center of the upper level. 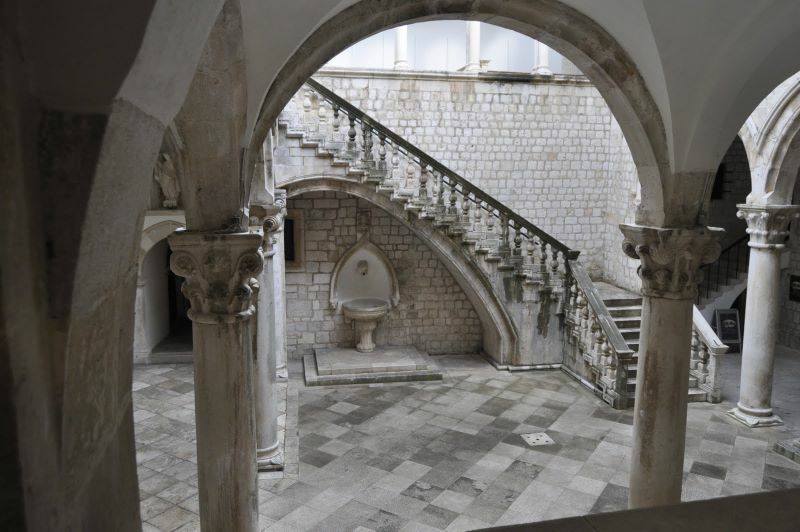 Another view of the larger stairs This atrium is one of thirty venues used during the Dubrovnik Summer Festival, held since 1949 to feature all of the performing arts. 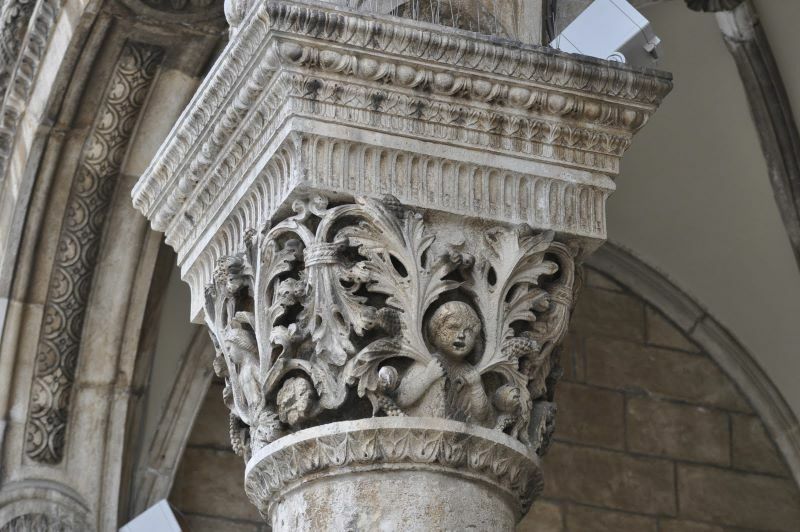 A few architectural details of the atrium: the capitals of the upper arches are much simpler than those on the western exterior. 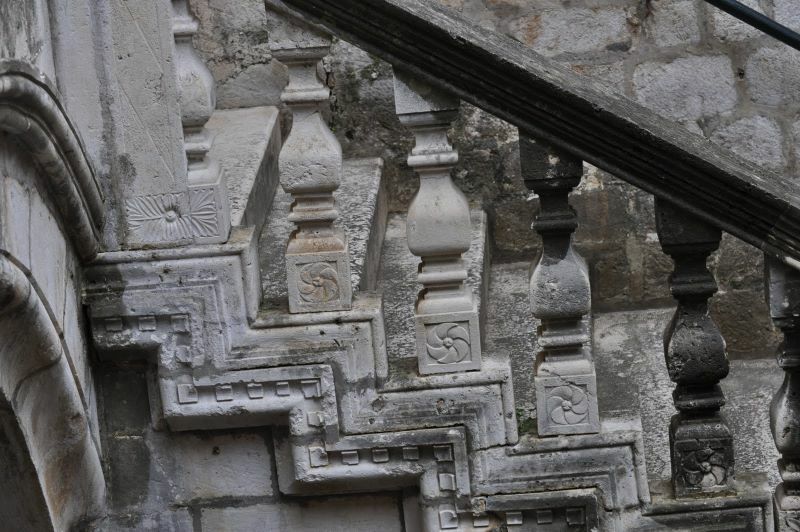 Some of the abstract iconography on the larger stairway could use a bit of restoration. 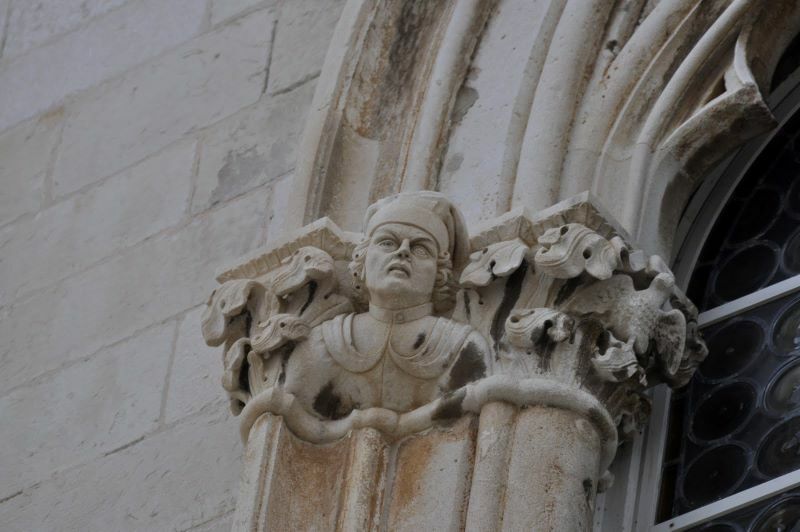 Dubrovnik's coat-of-arms seems to have a crown at its top even though this aristocratic republic was about as anti-king as could be. 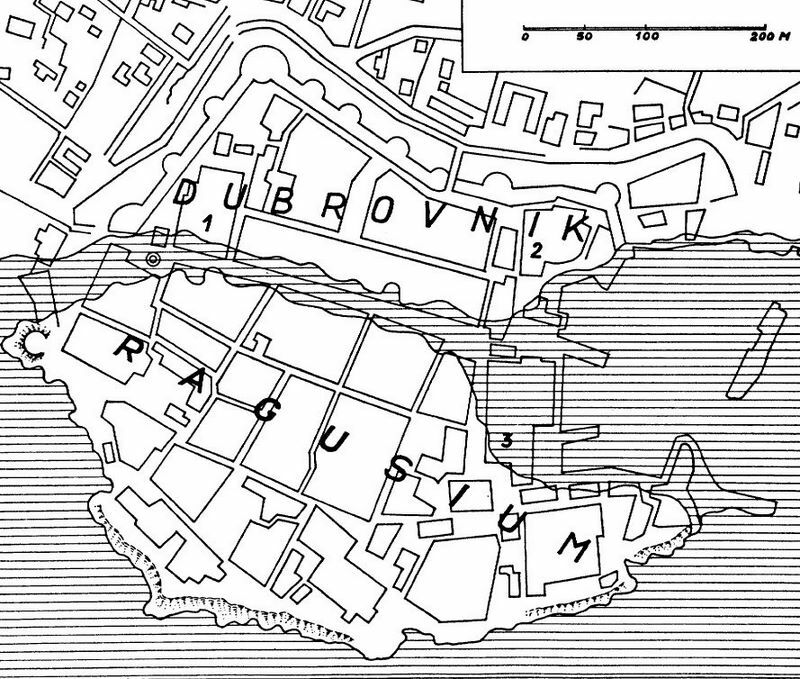 Power was solely in the hands of the nobles who bred so well in their closed social class that by the 16th century they numbered nearly 1500 -- and controlled all of the land. Their upper crust formed an oligarchy which ran things. But they ruled well and even the commoners were prosperous and individual rights were king -- and therefore there was little civil unrest during its 400 years of independence. More stairway reliefs Let's take a closer look at the angel that hovers over the Gothic doorway that led to the Senate chamber. 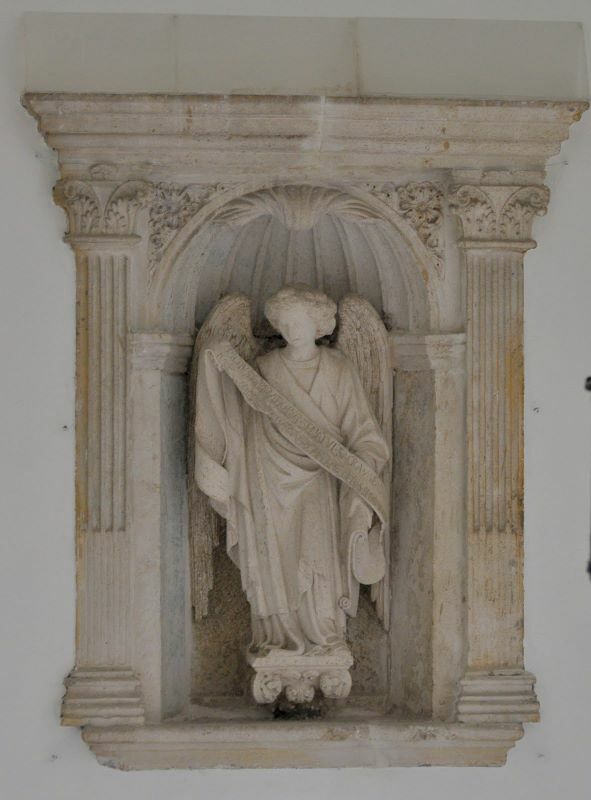 Beneath a Renaissance shell half-arch and standing on a Greek-inscribed base, this undocumented International Gothic angel sculpture appears to be the work of Pietro di Martino's school as well. 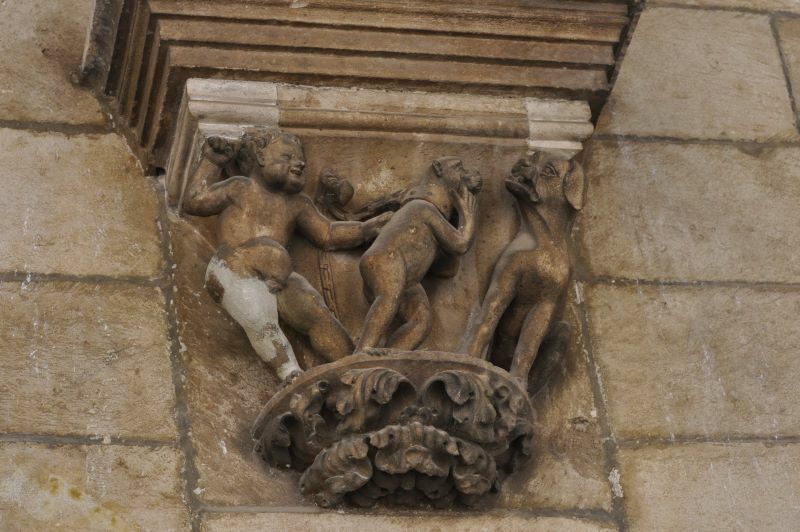 Like his Lady Justice, she holds a long scroll, this one extolling moral virtues. 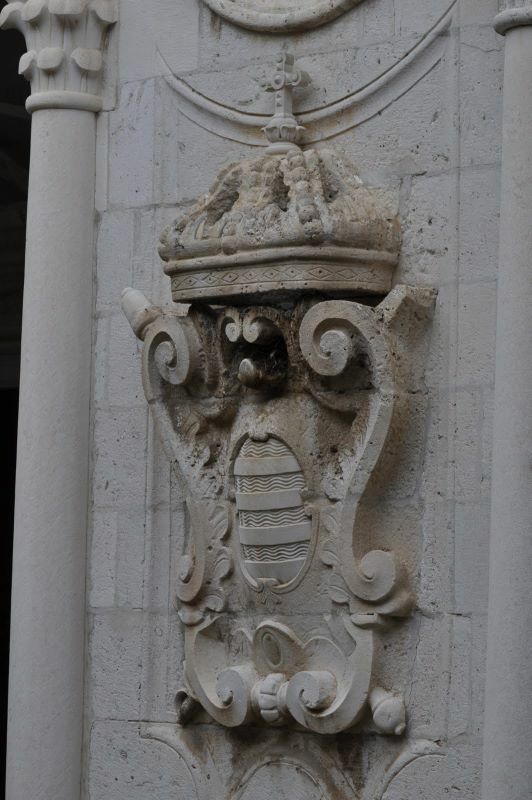 Her placement above the entrance to the senate chamber reminds senators of their ties to the Roman Senate. (The scroll echoes some Ciceronian phraseology.) 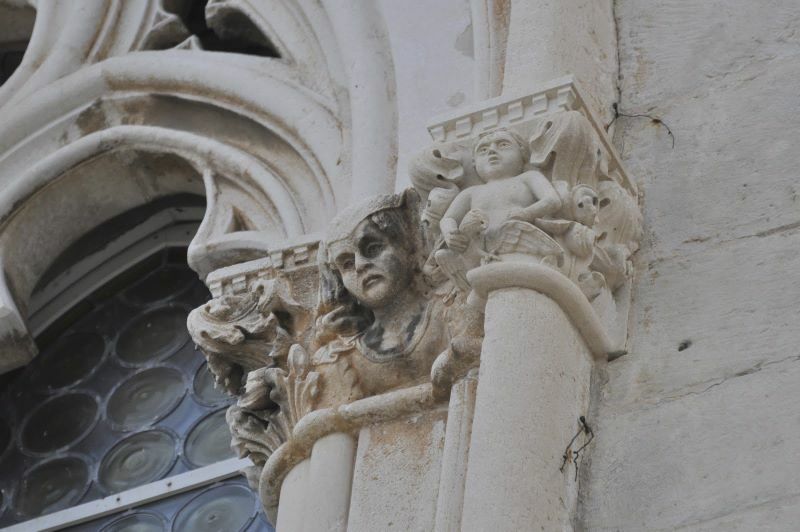 When this was carved, Dubrovnik was entering its Golden Age -- but comparisons with ancient Rome (even done by the Christian icon of an angel) would still be a bit on the pretentious side. 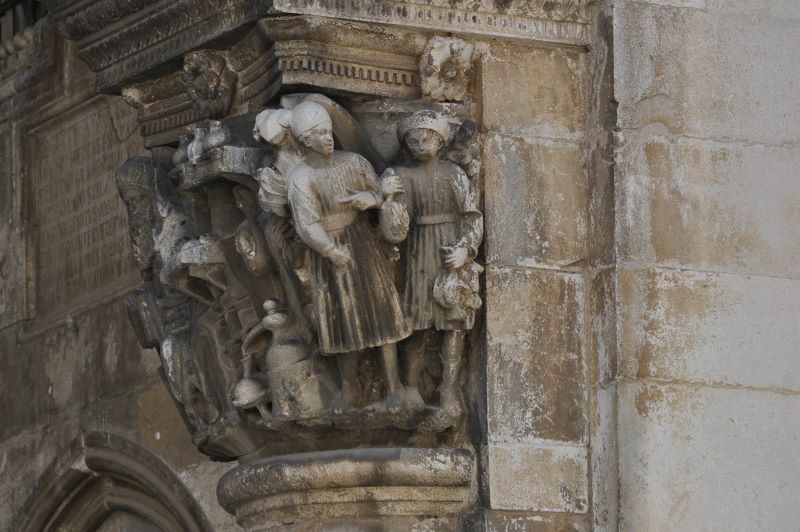 Here's another sculptural fragment damaged by the explosion to the building and moved here afterwards. 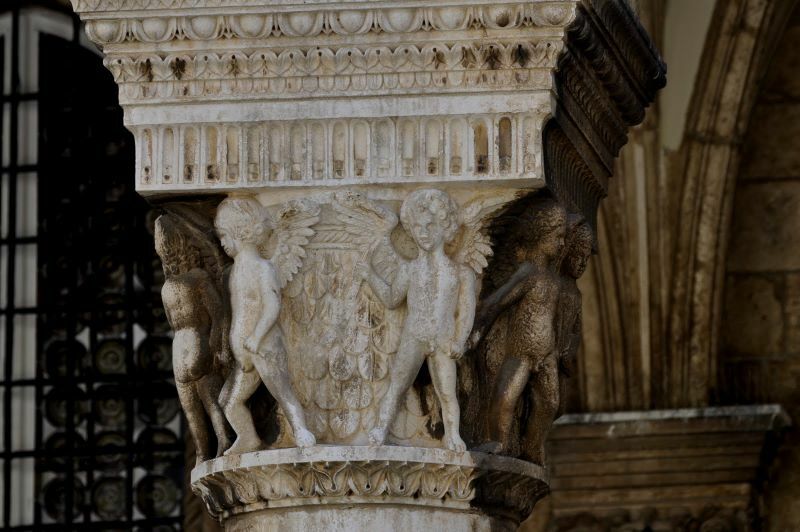 It's also by Pietro di Martino da Milano and his school who did the original exterior capitals. 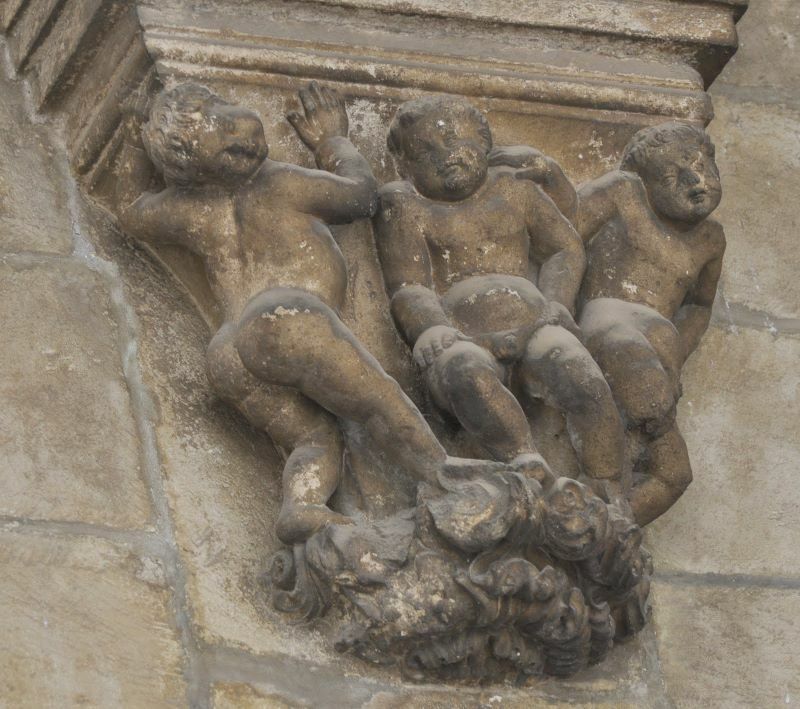 (This one was at the main doorway). 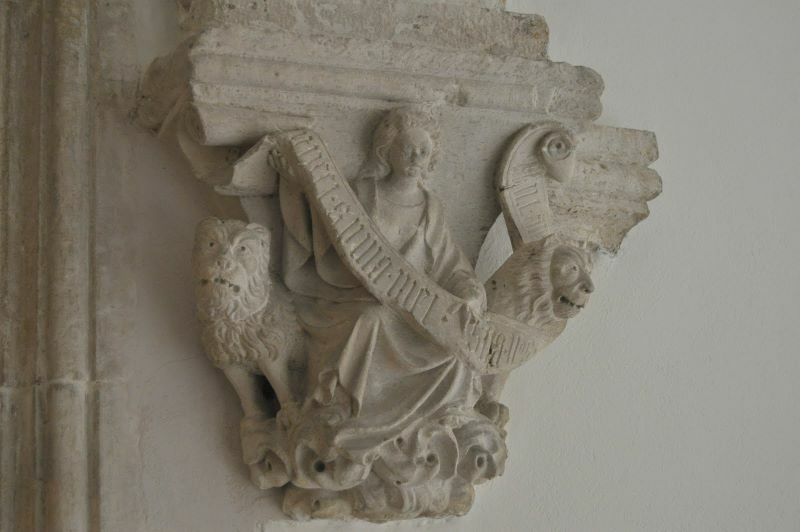 It shows the Roman goddess of Justice seatedbetween two lions and holding a scroll with perhaps laws. 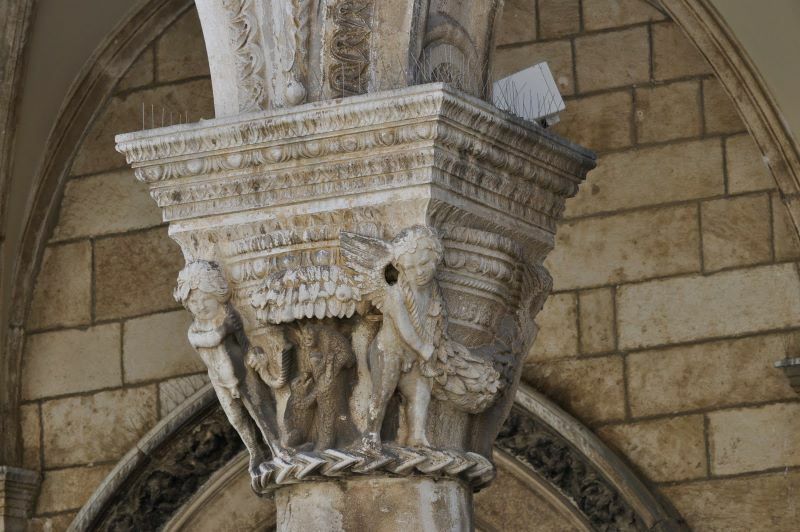 No blindfold and scales here, but the words carved in her scroll affirm the rights of the individual. Go figure! 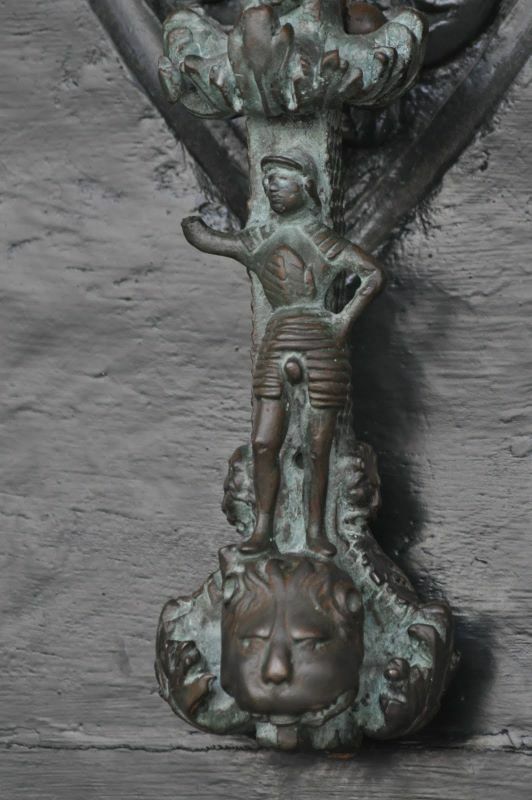 Even the lion below seems a bit disgusted with this bronze. Thanks for visiting. 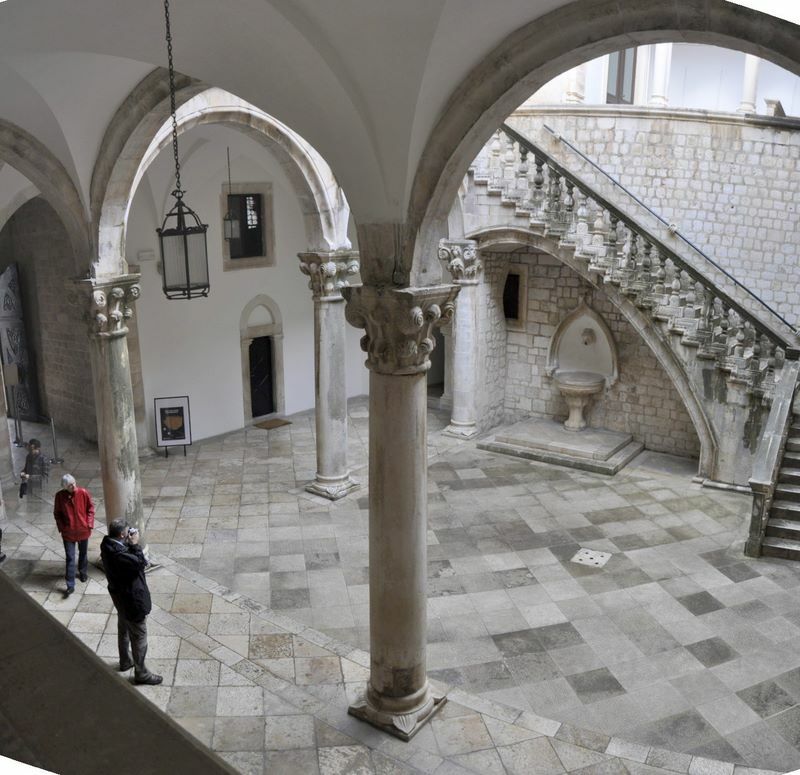 See all of our Dubrovnik slides by clicking here -- or visit all of our travel pages by clicking here. 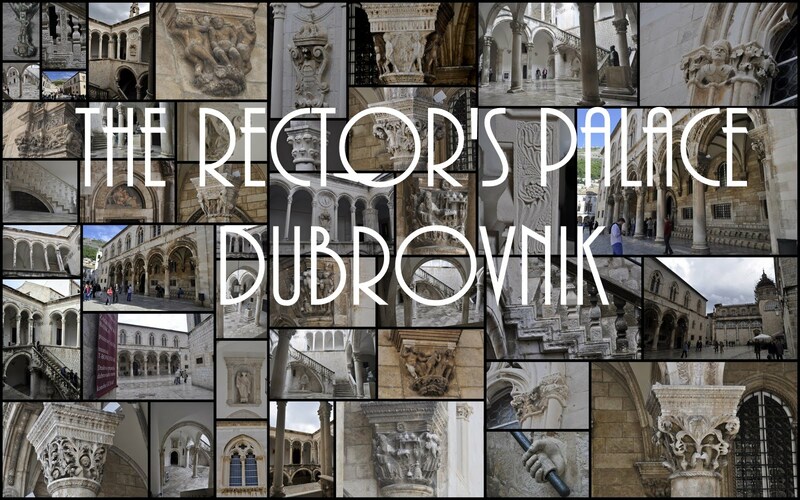 Please join us in the following slide show to give Dubrovnik's Rector's Palace the viewing it deserves by clicking here.